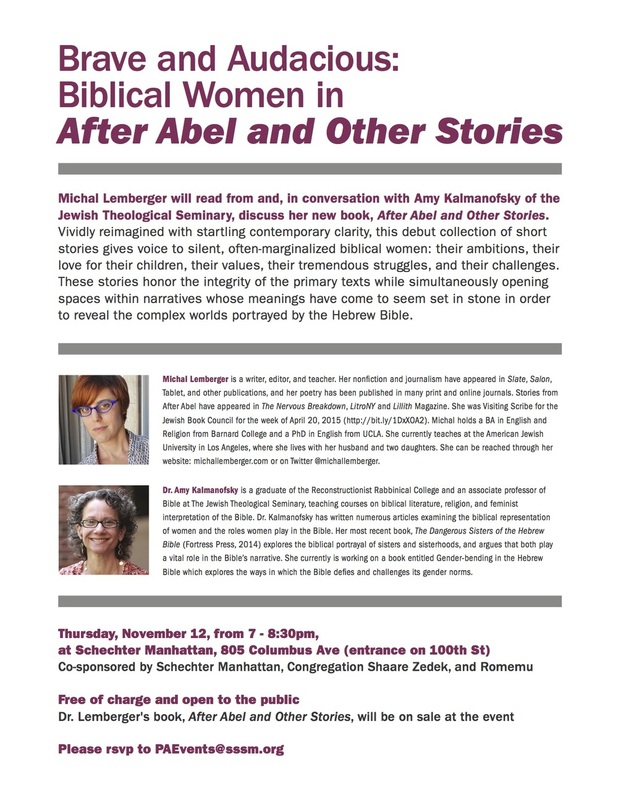 Brave and Audacious: Biblical Women in "After Abel and Other Stories"
Michal Lemberger will read from and, in conversation with Amy Kalmanofsky of the Jewish Theological Seminary, discuss her new book, After Abel and Other Stories. Vividly reimagined with startling contemporary clarity, this debut collection of short stories gives voice to silent, often-marginalized biblical women: their ambitions, their love for their children, their values, their tremendous struggles, and their challenges. These stories honor the integrity of the primary texts while simultaneously opening spaces within narratives whose meanings have come to seem set in stone in order to reveal the complex worlds portrayed by the Hebrew Bible. Please RSVP to PAEvents@sssm.org. Free of charge and open to the public. Dr. Lemberger's book will be on sale at the event. Dr. Amy Kalmanofsky is a graduate of the Reconstructionist Rabbinical College and an associate professor of Bible at The Jewish Theological Seminary, teaching courses on biblical literature, religion, and feminist interpretation of the Bible. Dr. Kalmanofsky has written numerous articles examining the biblical representation of women and the roles women play in the Bible. Her most recent book, The Dangerous Sisters of the Hebrew Bible (Fortress Press, 2014) explores the biblical portrayal of sisters and sisterhoods, and argues that both play a vital role in the Bible’s narrative. She currently is working on a book entitled Gender-bending in the Hebrew Bible which explores the ways in which the Bible defies and challenges its gender norms.